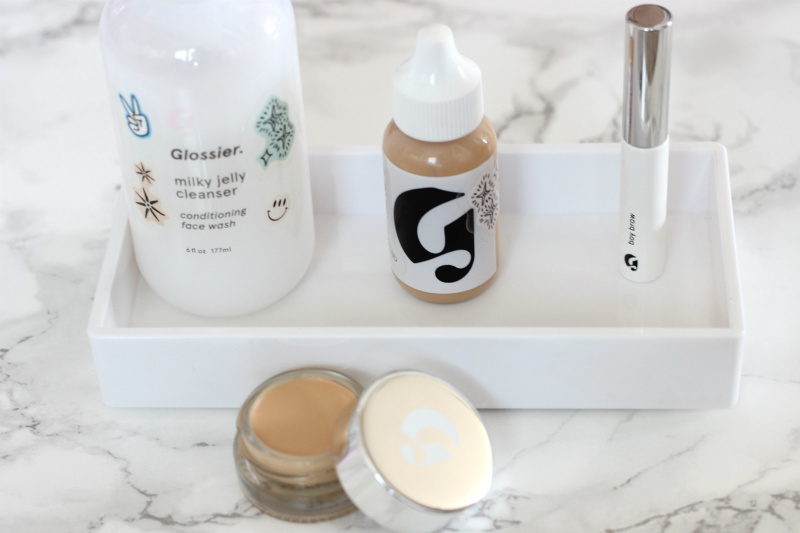 I’ve tried the tinted and clear version of Anastasia Beverly Hills Brow Gel, essence cosmetics Make Me Brow and Benefit Gimme Brow, so I felt it was only right to try out a similar product by Glossier – Boy Brow. Said to have a “…soft, flexible hold that doesn’t stiffen or flake. 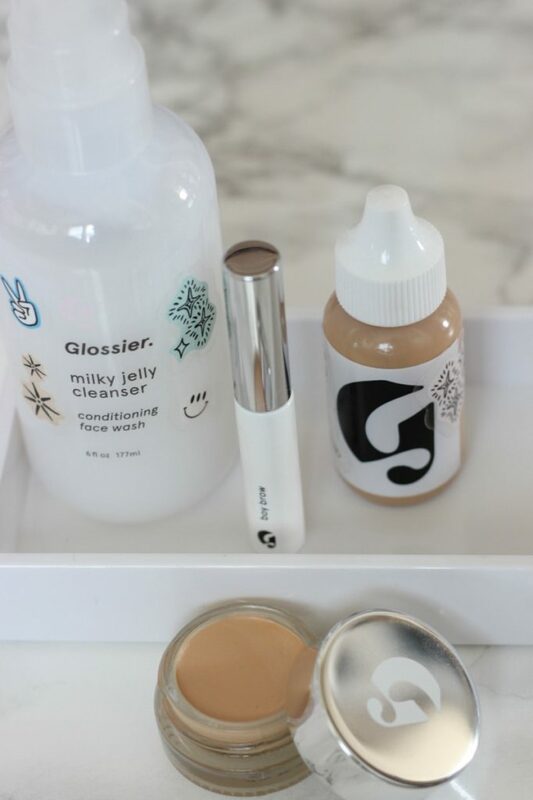 A sheer pigment load gives a natural oomph of color so brows look fuller and more even, and the tiny tapered brush allows for precise application,” on Glossier.com, I picked up Boy Brow in Blonde. The shade works perfectly for me. It doesn’t darken my naturally brunette brows and makes them blend better with my highlighted blonde hair. The packaging is perfect! Super minimalistic tube with a perfectly precise brush applicator makes it an easy-to-use product for even the most sloppy of applications. Basically, you can apply this to your brows without a mirror and be fine. It is not ‘crunchy’ and as described – soft and flexible. The pigment is sheer but gives your brows a bit more definition without feeling like Groucho Marx. My one qualm with Boy Brow is the that it’s possibly a bit too soft/waxy for my current climate. Living in hot and humid Houston with oily skin, the wax-based formula can bleed/spread a bit on my brow’s surrounding real estate, so I have to be very careful not to sweat too much on days I use this. Right now, Benefit Gimme Brow holds up a bit better. This issue may change as the temps start falling in the autumn/winter. It’s a great no-makeup/no-fuss weekend product or ‘first-timer’ brow product if pencils, powders and pomades freak you out. Boy Brow comes in three shades currently – blond, brown, black. I LOVE this product! I’ve never tried anything like it in terms of consistency. The coverage is light-medium to medium-full, but the cool part is how natural it wears on the skin. You literally look like you have naturally great skin. It is NOT full coverage and won’t completely mask imperfections (that’s not the Glossier way), but because of the nourishing properties, it just makes you look more perfected. It doesn’t cling to any dry flakes around breakouts and it gives under eye circles a nice dose of moisture so you don’t look dehydrated/tired. As an oily gal, this definitely works best when set with a light translucent powder otherwise it can fade sooner than I’d like. But the nice thing is it still maintains that naturally glowing look under most of my powders. The container is massive for how much product you need, so I’m confident this pot will last me until I’m 89. Stretch Concealer is also great on its own without Skin Tint or any other face base product (great for those on the go who like a little coverage with minimal ‘blending’ required). 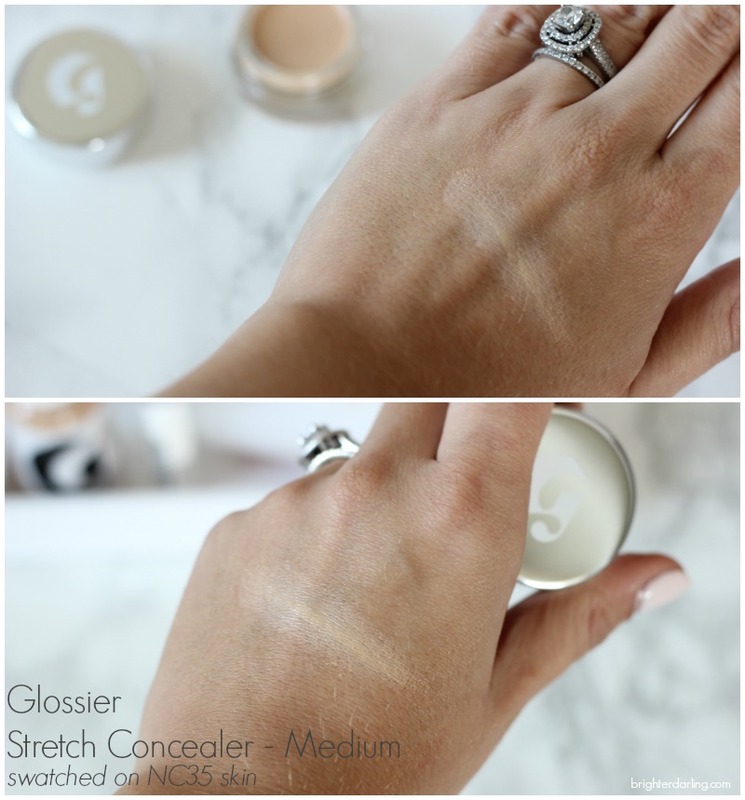 Stretch Concealer currently comes in five shades from light to rich. I use shade Deep in Skin Tint and Medium in Stretch Concealer for a slightly more brightening effect. I expected Milky Jelly Cleanser to be very similar to a CeraVe Hydrating Cleanser or Cetaphil. It is not. It’s definitely a milky jelly cream gel cleanser (LOL). Lightly rose-scented, I used this to remove makeup on dry skin and on wet skin. Although it needs a little extra help to remove heavy makeup and waterproof mascara, it packs a punch for a non-foaming product. 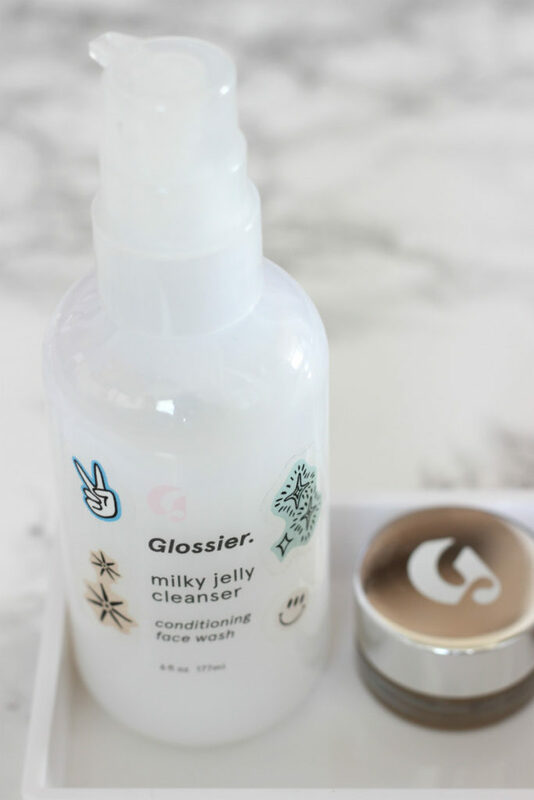 My favorite ways to use Milky Jelly Cleanser are at night after a makeup removing oil cleanser/balm or in the mornings to wash off any night-time skin care products. My skin never feels tight or red after using this… but it also doesn’t leave it feeling greasy/dirty – just clean. 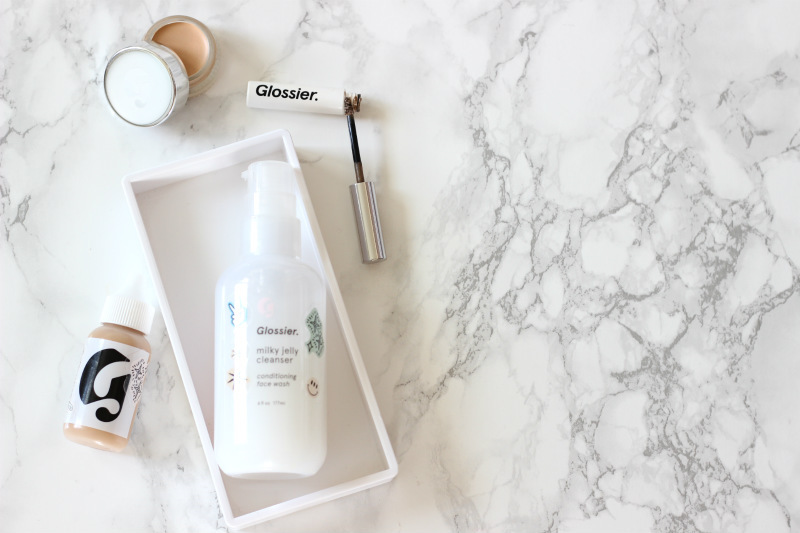 It’s similar to CeraVe or Cetaphil in gentleness, but imagine Milky Jelly Cleanser to be their older, more sophisticated cousin who spends her summers in the Hamptons and is as effortless as a Parisian model :-D.
Have you tried any of these newer Glossier products? What are your thoughts? They also just launched THREE new serums called The Supers – one to plump, one to glow, and one to calm. 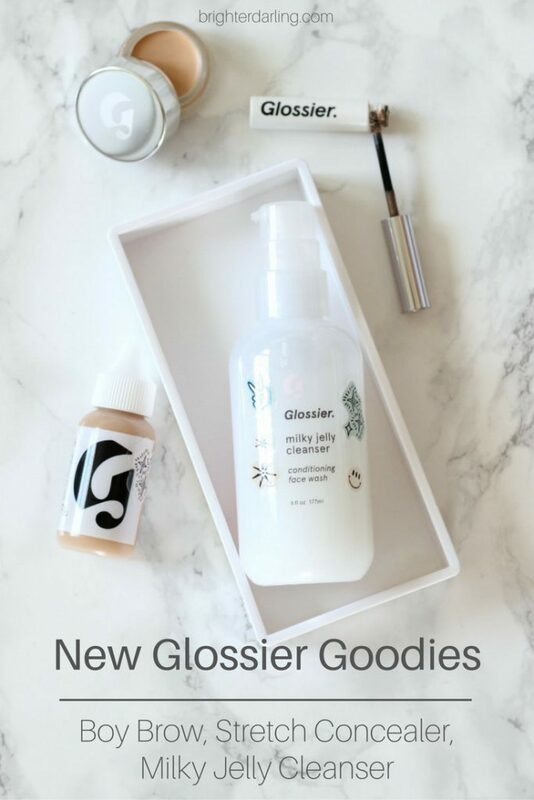 Very curious about those – especially Super Glow and Super Pure. "My First HydraFacial at Caesar’s Qua Spa in Las Vegas"